Lizzie Armanto Nominated as "Top Action Athlete"! Votes Needed! - Yo! Venice! Home Venice Beach California Lizzie Armanto Nominated as “Top Action Athlete”! Votes Needed! Lizzie Armanto Nominated as “Top Action Athlete”! Votes Needed! Lizzie Armanto, the 19 year old Santa Monica skater who can often times be seen at the Venice Skatepark, has been nominated by ESPN/ XGames as one of their “top action sports athletes“. ESPN/ XGames.com has created its own version of “March Madness” by ranking the top action sports athletes and placing them in men’s and women’s brackets. 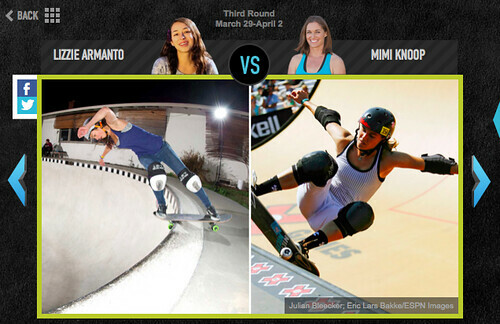 Online votes will crown the top current action sports star in the world, emphasis on current. Please click here to cast your vote for Lizzie in the women’s division! Doing so only takes a second and you do not need to register or give the website your email address! Please share this post and ask your friends to vote! Right now Lizzie is trailing Mimi Knoop with 49% of the votes, so your vote may help her win this round!